Awesome views from Mariepskop. The runway at Hoedpruit can be seen top right. So you've all ridden Sani Pass, but have you thought about doing SA's second biggest altitude gaining pass? 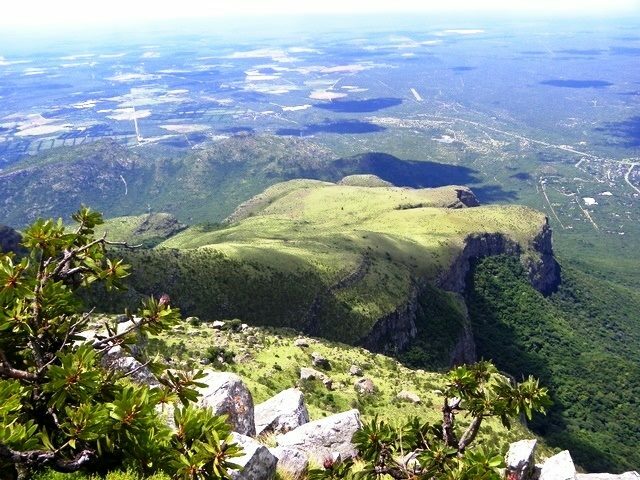 The road climbs 1100m over 13,7 km and offers a variety of scenery which includes indigenous mountain forests, remote waterfalls, rocky plateaus and some of the finest scenery you will find anywhere in South Africa. Getting to Mariepskop is a bit of a mission and requires precise navigation. We explore the area and take a look at Hoedspruit, and unpack some of the folklore about wars in 1846 and skeletons littering the Mariepskop cliffs. Then there is the story about Steinhaeckers Horsemen, Harry Wolhuter and other dubious heroes of the time. Read the article, enjoy the videos - then set your dates and go and klap this one. What makes this pass unique is that it is a dead-end and that means very few people take this road less travelled. We filmed the entire pass and the waterfall access road during April in fairly misty conditions, and have just released a brand new 8 part video set covering this big pass. It's no big deal for an experienced biker, but the visual rewards and sheer variety make this a bucket list pass. One of my all-time favourite rides! Well worth the trip! And you can spend the night at the bottom at the Blyde rivier camp. Epic! Will have to put this on my bucket list.